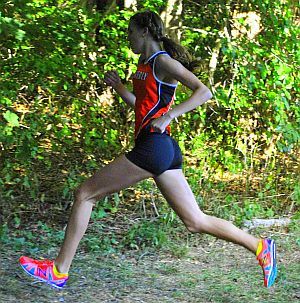 Abby: I started coming to Coach Braz's program the summer going into my freshman year and it's always a great way to prepare for my xc season. It keeps me focused all summer and provides structure. This year especially we focused a lot on core and becoming stronger runners. Each year I continue to grow with the program. Coach Braz always brings in new, and fun workouts to do. GTD: When you're doing the "running" parts of the program, do you ever "visualize" a xc race? Abby: Yes, I like to do the same things leading up to a race. Usually for the morning meets I'll eat a piece of cinnamon raisin toast with peanut butter and bananas. Then I have a few bites of a power bar about an hour before the race. I like to listen to music to keep my mind off the race. After I eat I start warming up and stretching. On the line I do dynamics and strides up until the start of the race.